Sara joined me for a portion of my weekend training--the big ol' run part. I can't speak for her, but I think halfway through our 10-miler on Saturday the freshness was fading. Coming off a 30+ mile Santiago Canyon ride that morning, we ran fairly well (about a 7:45 avg), but I think it's because we just wanted to be done asap! As expected, it was hard to wake up to Sunday's alarm, but getting an early start was necessary in order not to be incredibly late to the afternoon Baby Shower I was invited to. I needed a change of scenery from LF, so I parked in San Juan Capistrano and rode south through Camp Pendleton and back for a total of 65+ miles. Surprisingly, my legs felt good and I was done with the whole outing in 3 1/2 hours, with breaks. Now, I love my group of girlfriends who were at the shower, but when it comes to babies and being married (or wanting those things)--which summarizes most of their lives--I just feel like an alien around them. I have zero desire to have kids anytime soon, and tying the knot isn't exactly a high priority either. Needless to say, I get confused looks when I say that I'd rather do Ironmans for the next X amount of years rather than change diapers. 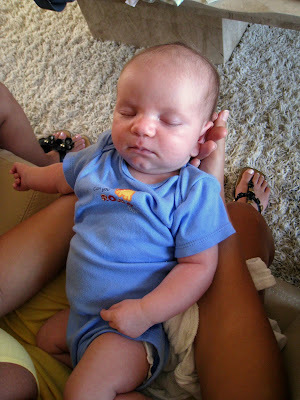 And even after (or if) I finally get to those diaper days, you can bet I'll still race as long as this body allows it. Noah's parents, Marcai and Randy, live close to Santa Barbara, and for a second they wanted to come to my race Saturday, but the idea of bringing a newborn? Not gonna to happen. See, just another reason why kids should not be on my to-do list... I'll just stick to admiring them from afar. I have too much I want to accomplish first. 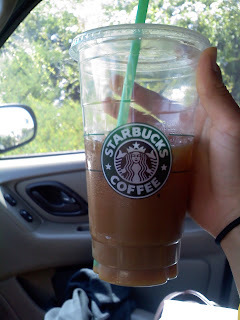 Venti Mocha Fraps are the only thing that get me through some days. Oh doG... I could really use another one right about now. I won't even touch (or look at, frankly) a baby, nevermind consider ever having one of my own. Blech. Great job with a heavy week. I think it is great how you always balance your life out. Good luck with the start of a new school year. Keep on enjoying to do what you love. Marriage and possible kids will all come when the time is right. I think it is great that you recognize what makes you happy. I would like to say that you should not feel like an alien around those folks. Not everyone should be a parent and if its not right for you...TRIATHLON sure is. Your a machine and there is no reason why you shouldnt continue to take advantage of that talent. NICE WORK.